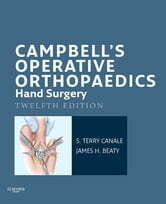 Now available for the first time -a convenient eBook on hand surgery from***Campbell's Operative Orthopaedics***, edited by Drs. S. Terry Canale and James H. Beaty! Load it onto your mobile device or laptop for quick access to world-renowned guidance on hand surgery from the experts at the Campbell Clinic. 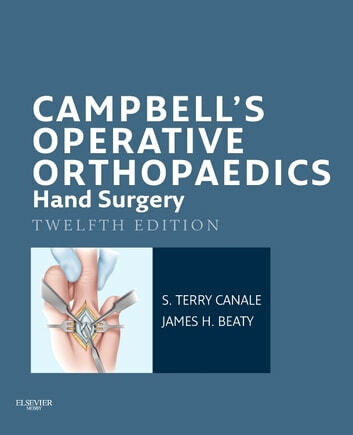 Achieve optimal outcomes in hand surgery with practical, high-yield chapters on Basic Surgical Techniques • Fractures, Dislocations, Ligaments • Nerve Injuries • Paralytic Hand • Arthritic Hand • Compartment Syndrome / Volkmann • Dupuytren • Carpal / Ulnar Tunnel • Tumors / Tumorous Conditions • and Congenital Anomalies. Vividly visualize how to proceed with a wealth of completely new step-by-step illustrations and photos especially commissioned for this edition. Depend on the authority of Campbell's Operative Orthopaedics- themost trusted and widely used resource in orthopaedic surgery, authored by Drs. S. Terry Canale, James H. Beaty, and 3 other authorities from the world-renowned Campbell Clinic.